As ever the blogs seem to concentrate on the enablers for effective working rather than the procurement tools and techniques covered in the workshop. And yes there's a degree of similarity in the index between Category Management and the Supplier Management workshops - not because the procurement tools were similar - but because soft skills, change management, communication, influencing and creativity are common enablers, and are all skills requiring development and use in all aspects of procurement activity. Why do I have to adapt my style? The answer being, you don't have to adapt if what you're doing is delivering the outcome you want. If you want a different outcome you can either continue to do what you're doing, or change. Game playing - if senior stakeholders (or suppliers for that matter) are playing games do you join them or not? Organisation's operating metaphors - links to the 'games' we might be playing - war? race? What does respect look like to you - and is it the same for them? How do we define honesty? Language of slopey shoulders - who, if not you, is 'the organisation' or 'they' you speak of. How do I spell Can't ........... W O N T - insight from my personal training session when I said I couldn't do something! The Assertion scale - are you too passive or aggressive? Supplier relationship management or relationship management - what's in a name? Gardening as a metaphor for supplier management - because suppliers need weeding, feeding, pruning and mowing and internal stakeholders can understand procurement better by using this metaphor. 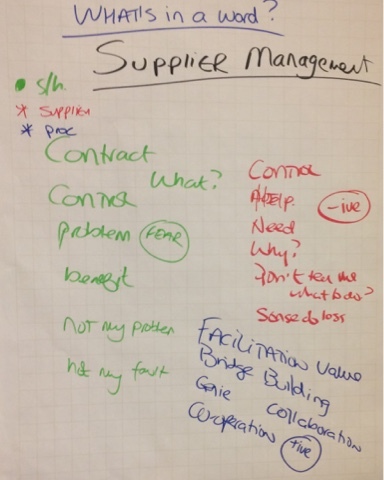 The cost of getting procurement wrong - Pinterest board of horror stories of supplier management gone wrong! That is added to on an ongoing basis. Is your supplier management like a thermostat? Are you KPIs inspiring positive change? 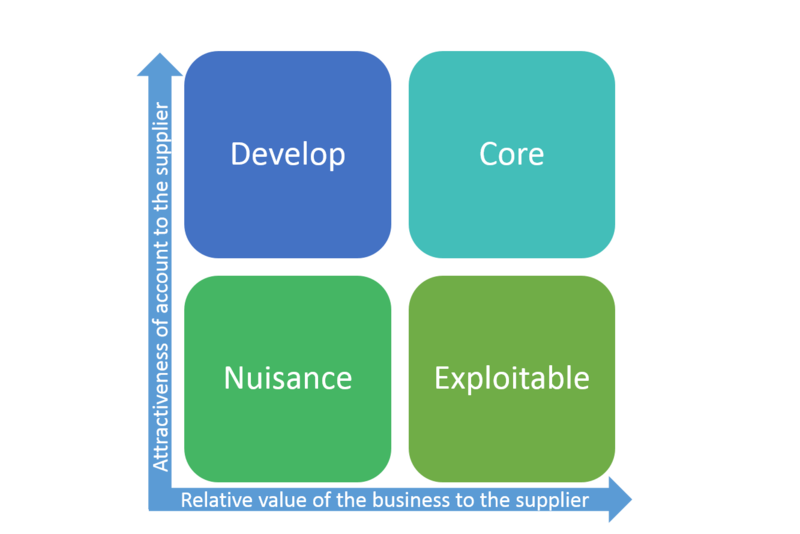 Will you change the buyer / supplier archetype? 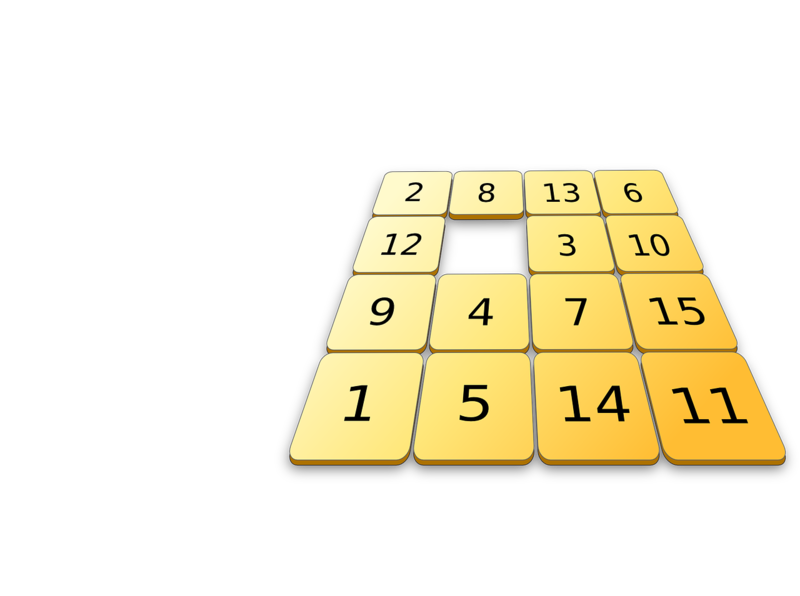 Problem reversal - a great technique for problem solving. What's in a word - would relationship management be a better term than supplier relationship management? 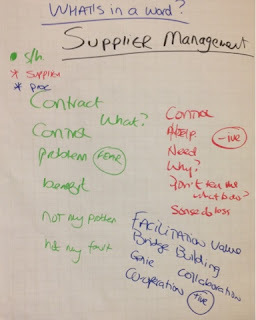 See picture for what we think the 3 different interpretations of 'supplier management' might be dependant on whether we're procurement, a supplier or an internal stakeholder. The language of stick and carrot - because we need to be consciously aware of which of these we're using. The link between mind, body and emotions. More on organisational and personal metaphors and the words we use for each (exploit, attach, fight, war, threat and enemy are words that work well for those operating a war like metaphor, but won't work with someone who operates a nature like metaphor for their life). 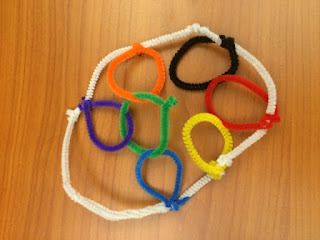 Use of pipe cleaners to solve problems!?! For other more procurementy or businessy blogs I've written please see this index. How attractive are you to suppliers? 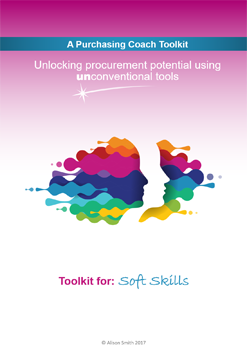 In the majority of procurement literature, workshops and exams buyers are asked to consider the above 'supplier preferencing' model. It identifies 4 potential ways a supplier can 'view' the buying organisation. The premise is: a supplier who sees your account as highly attractive, AND as contributing a larger share of their sales is likely to see your account as Core. With the same level of attractiveness, but smaller percentage of sales, it becomes an account they would like to Develop. The potential problems arise when an account isn't very attractive - with the resulting potential for either Exploitation or being treated as a Nuisance dependant on the relative value of the sales. The main reason for using this model in workshops is to invite buyers to consider the behaviour they may be demonstrating that might be seen by a supplier as unattractive, and therefore is very likely to be contributing to less than helpful behaviours from the supplier. Or, if they aren't doing currently, might do so in the future. Extending payment - see my rant on 'who owns payment terms' directed at CFO's who forget it's part of the contract that buyers agree with suppliers - ie not something Finance should alter at whim! Bullying - see two related blogs on the subject Don't turn a blind eye (to unacceptable business behaviours) and Are your supplier afraid to say no? Disrespectful behaviour - see do your suppliers' sleep at night blog? Consideration is also given to what behaviours might be considered attractive - many of which are the opposite to the above. Yes sales is attractive, but this model is asking buyers to consider what might detract from the value of the sales, and mean the buying organisation's needs are not as important to the supplier as we would like them to be. It's a strategy a supplier has irrespective of turnover, but certainly something they're more likely to consider if the account is becoming increasingly unattractive. This is a point I often find myself disagreeing with other buyers and colleagues about - the assumption that any sale is better than none. I believe for every supplier there will be a point where the level of unattractiveness means a supplier will decide the best option is to walk away. When sharing the model in workshops we often use the metaphor of personal relationships. With first dates, dating, marriage and divorce being mentioned. We've all known people who have stayed in a relationship well past its sell by date, and as a consequence their health, well being and sometimes financial health are compromised. It's no difference with suppliers - there will be a point - if pushed to far - when they say "enough" and walk away. Assessing power between a buyer and supplier can only take you so far. Once someone's values such as respect, honesty, integrity and fairness are being compromised you'll be surprised what people are willing to do despite the consequences. 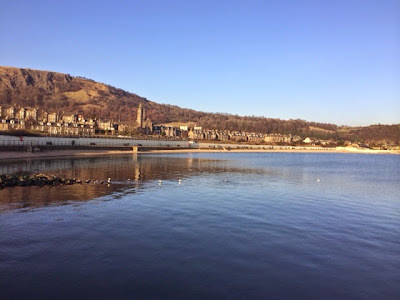 (My blog 'Ethical behaviour comes with integrity' also discusses what people are prepared, and not prepared to put up with as a result of their values). I would love to know your thoughts - as a supplier have you walked away when everyone else would expect you to stick around, and put up with what you believe to be unacceptable behaviour. 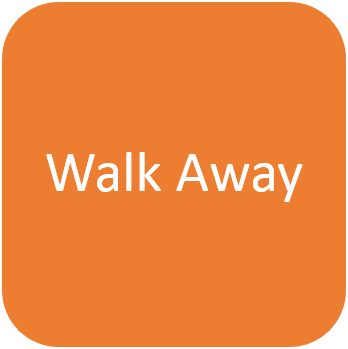 As a buyer have you been surprised when a supplier has made the decision to just walk away, and what were the reasons given. For blogs on other topics covered during procurement workshops see blog entitled I've written a blog on that. Please see below a duplicate of today's blog over on the Landscaping Your Life web page. Although of course I'd love you to pop over there, subscribe and tell your friends too. 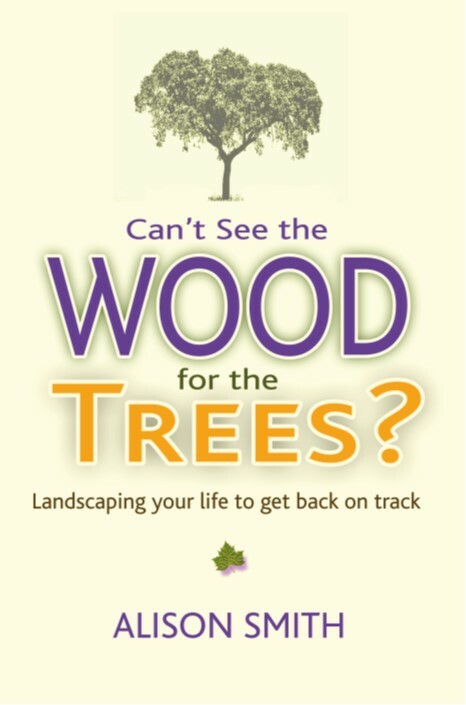 Since April 2000 I've used nature as our teacher and metaphor for life with clients helping them to get back on track. 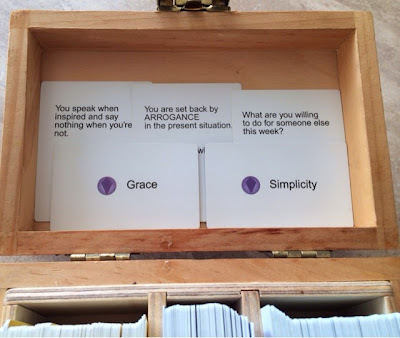 As a result I've developed many different tools and techniques, and the collective term used to describe these terms is Landscaping Your Life. Of all the different tools I use to help people get back on track Landscaping Your Life has been the most effective, and efficient too. It's why it's still a tool I use often with others and myself. It's as if it's stood the test of time - like much of nature itself. Landscaping Your Life tools are very quick, and the insight can stay with people for years. Easy for me to say I know. I'm hoping with this launch, therefore, that I can encourage past clients to share their experiences so that you may learn of its efficacy from them rather than me. That said the easiest way to check LYL's effectiveness is to try it for yourself. Why not have a read of some of the following blogs, pick one of the tools and have a go for yourself - and do let me know how you get on. Or simply join me going forward as I add new blogs with insight from nature, or share tools you can use at work or home, alone or in groups, to help provide insight on a challenge. 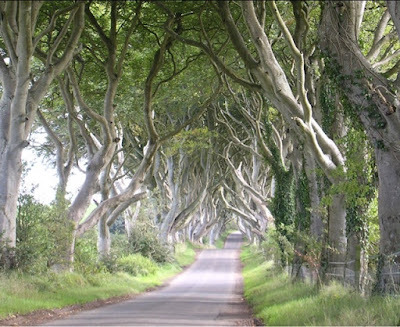 Using imagined landscapes to improve challenges: e.g. connecting to your audience, confidence when speaking, destressing. I hope as you've explored some of these posts they have given you a flavour of what's possible when using nature as your teacher. I also hope that you will now join me here, on YouTube, pinterest and/or Facebook as I further explore the changes that can be inspired when we allow Landscaping Your Life, and perhaps more importantly nature, to do its magic! A new year Landscaping Your Life workshop is being considered in a venue in the north of England or Scotland. Do let me know, therefore, if you'd like to be kept updated as plans take shape. Or would like me to consider workshops in your part of the world (Hawaii and Australia would be great destinations for a holiday too :-)). 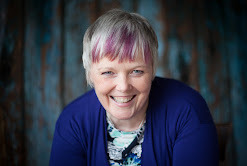 Coaching and group facilitation are also available - do call me +44 (0)7770 538159 or alison@alisonsmith.eu. I look forward, over the coming weeks, months and years, to exploring with you what nature has to teach us so we may all stay on track and find our flow. You know that feeling when you think something should be easier than it is, and you're getting increasingly frustrated at what the other person is saying because it's still not making sense? A bit like when you're trying to do one of the above puzzles, and you're just moving the tiles around in some random order, and getting nowhere. I had 2 of those sorts of conversations this morning - one on the phone to the bank, and the other whilst tweeting back and forth with Tesco regarding my club card vouchers (mundane I know but a useful example as you'll find out)! The common cause of this frustration was misunderstanding - on both sides. That is on both occasions both parties felt what they were saying was easy to understand, and therefore getting frustrated at the lack of understanding by the other person. With Tesco it involved me having to go back to the beginning and confirm that when I used this URL, and pressed that button, this appeared and not what they were telling me. Of course when they had the missing piece of the jigsaw they then realised the cause of the misunderstanding, and could tell me what URL to use instead. My debit card can be used to authenticate my account on the card reader - ie I don't need a authentication card as I have used in the past - (how simple). The card reader provided for my old business account can be used for my new business account - perhaps a little more obvious once points 1 & 2 have been clarified. Postscript upon trying this out: no that doesn't work, and my lack of understanding was because there was no logic, and no way on Earth the advice given was going to work, and yes an authentication card is required - which they will now send me!!! Not sure what language we were both talking but it certainly wasn't the same one!! I should trust my intuition more because I knew it wasn't right and kept checking, but that obviously simply got us into the realms of more miscommunication. "For you to be this angry and vocal about the situation I know you're right. However I don't yet know why you're right. That is there is a missing piece of knowledge or logic that you know that I don't - yet. Help me find the missing piece of information before we come to blows." How often when we're disagreeing with someone do we assume it's a real disagreement rather than spend a little time to confirm we're talking the same language, and to find the common ground. 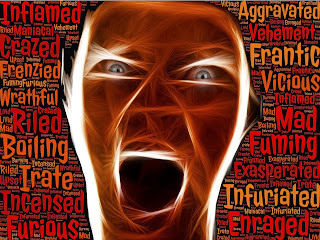 It is not true to say that a person's behaviour made us angry. It is true to say we chose to be angry as a result of the other person's behaviour. A subtle difference, and yet one that changes the responsibility for the anger from the other person to us. Something we often don't like to take responsibility for - preferring instead to continue to blame the other person. Anger that is appropriate, and ensures we take action to distance ourselves from the source of the unacceptable behaviour. That is situations where most people would agree with us about the unacceptableness of the other persons actions. These situations are often supported by the law, codes of conduct and ethics, or human rights. Anger that arises when one of our buttons has been pressed - ie other people might not necessarily agree with us about the unacceptableness of the other person's actions. It's this latter form of anger I want to explore. Last week I discussed the situation where our anger arises from compromised values. That is we value a behaviour so much we get angry when other people don't meet our expectations in that regard. Today I want to look at anger when its source is the disowned parts of us that we see in other people. I'm sure we can all recall times when someone has said of another "they're so arrogant" or "rude","selfish", "lazy", "critical", "aggressive", "dishonest", "competitive" and so on - when our response to them would ideally be "and so are you". The key is remembering if we can say "and so are you" when someone judges another person - then the same can be said of us. That is we too can judge other people simply because it's a fault we don't accept in ourselves. The key to recognising this is happening is that anger or irritation is often involved. If non of these have pressed your buttons then write your own list of what behaviours do press your buttons and that illicit an angry / irritated response. To do this you may want to remember when you've been irritated with someone, and identify the behaviour they were demonstrating that triggered your reaction. Are you irritated every time everyone demonstrates this behaviour or just some people - what's the difference between those whose behaviour you accept, and those that you get angry about? Do you get angry when you demonstrate this behaviour - and what excuses differences are there between you demonstrating the behaviour and other people? Is the behaviour compromising a value you have? Is this a behaviour you perhaps need to learn how to do more of - for example we could get angry about someone being selfish because a part of us knows we need to learn how to think of ourselves more than others sometimes. Is this a behaviour you demonstrate that you don't like nor accept in yourself. The clue we're onto something useful for this last point is the discomfort we feel when we 'agree' we too can be seen by others to demonstrate, some of the time, some aspects of, that behaviour - but we don't like it. Another clue we're disowning that part is the ease with which we can run down the rest of the list and say "yes I can be like that sometimes" with no emotion nor discomfort accompanying the statement. Yet when we get to a disowned behaviour we resist acknowledging that this behaviour is also a part of our repertoire. We get uncomfortable and try to qualify our behaviour. To take the anger out of our judgement of others requires us to own, acknowledge and appreciate that behaviour in ourselves. Oddly as it sounds it's this ownership that takes the heat our of our own behaviour - it's as if when we don't own it - the behaviour controls us. As soon as we own it we have choice about how we demonstrate the behaviour - enabling us to utilise all its best qualities rather than only show its more challenging sides. The benefits to be gained from that behaviour (e.g. we may resist selfishness because we can't see any benefits from doing it)? or what's the positive energy behind the behaviour? What other terms can be used to describe this behaviour (e.g selfishness might be described as having courage, supporting well being, assertiveness, ensuring sustainability and survival. Another way to get at the benefits)? How can you demonstrate this behaviour more usefully? What situations does this behaviour come up in for you - with specific people, in specific places, in reaction to specific behaviours? How does, or has, this behaviour set you back in the past - ie think of a specific instance (sometimes we're holding on to a specific event, and therefore acknowledging the pain (setback) we're still holding on to allows the behaviour to become just like the other behaviours). How might you deal with these situations differently in the future? I'd love to know if you've had any ah-ha's as you've read this. * Every time I read 'Reasons to be angry part 2' I think of Ian and the Blockheads Reasons to be Cheerful part 3 and remember seeing them at the Victoria Hall, Stoke on Trent in 1978! Oh dear - with my birthday approaching - that does make me feel old! *** I do like Johnhain's pictures (as shown above) and found in Pixabay - I've used his images a few times on this blog. I must buy him a coffee very soon.